If there is one accessory that I would say is a must-have for a baseball or softball athlete, it’s a chest guard or chest protector. Getting hit in the chest is usually not dangerous, although it can be painful. However, there are several cases each year in which children get hit in the chest and are severely injured or killed because the impact causes a fatal abnormal heart rhythm. This article posted on the ABC News website is a perfect example and explains how this type of injury is caused. Now, I don’t want to freak anybody out because this type of accident is extremely rare, but in my opinion, there’s no reason not to add this small piece-of-mind accessory to your child’s equipment. Both of my boys wear them and and it also gives them the additional confidence of being protected from bad hops just in case they happen. This is a high quality compression shirt made out of a moisture-wicking performance fabric much like Nike’s Dri-fit lines. The shirt has a snug fit but still allows mobility, and also provides muscle support. It comes with an insert that when taken out of the package is soft, but hardens to a molded shape to fit your child’s body. The insert is also removable for washing. My sons have both used other chest protectors over the years, but I have found this one to be the best on the market. The other ones seem to fall apart quickly after a few trips through the laundry and become thin and stretched out. Having been a baseball mom for 11 years now, I believe this is the one piece of equipment that your player should definitely not do without. If you have any questions on this product, please feel free to comment below. A chest guard is a very good idea. An 80mph+ fastball can definitely do some damage. If one is lucky enough to avoid the damage, the pain is just incredible, as you mention. That image of the chest guard at the top of your article looks cool. Looks like something a superhero would wear. I followed your link to Amazon and was surprised to see the very reasonable cost of this item. This may be worth investing into for lots of different reasons. Out of all the newer protective gear designed for baseball and softball, the chest guards are one of the most important, and least intrusive to wear. As a youth baseball coach, the safety at that age is first priority. Most kids at a young age don’t have the reflexes or reaction capabilities to get out of the way of a hrad hit ball. Especially being only 40-46 feet away. Highly recommended for any youth player. 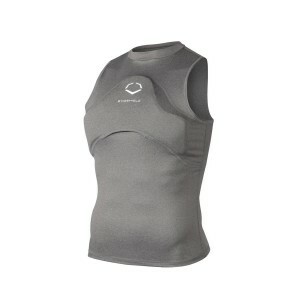 My son got hit by a line drive while pitching last year, never wore a chest protector, the day after, we went straight to the store, Evo shield was the one that stood out, because it formed to his chest. That was the scariest thing to witness, still haunted by it. I now tell everyone who’s child pitches about your product. Great to hear that. I’ve read some scary articles of kids getting hit in the chest and they didn’t turn out good.